Another new bug since the update is my base no longer has a shadow and only items in or on the base cast shadows. Makes everything look wacky like there are puddles on the floors. But they are shadows from things outside. Shadows of fish and plants in an Alien containment in a room above this one. 1. Fabricator wont list HUD Thermometer even when Blueprint unlocked. Item is listed in Blueprints but you cant create it. When swimming or building thermal power plants we have no way of knowing if we are even in hot water till you take damage, at which point it becomes very obvious. If your gonna remove it from the fabricator then get it off the Blueprint list so people aren't mislead to believe they should be able to build it. And Maybe just give us the temperature while in the Dive suit as a given, since our senses would be telling us what the basic temp would be anyway. 2. Aggressive fauna glitching into base and into alien containment, then going about a killing spree. I have had this happen numerous times mostly with Biters. Only once I had a Sandshark in my base but he didn't make it into the alien containment before I discovered him. 3. The Lifepod beacon icon floats onscreen when shut off in beacon manager after restart. This happens every time game restarts. You have to turn beacon back on, then turn it back off every time you play. 4. 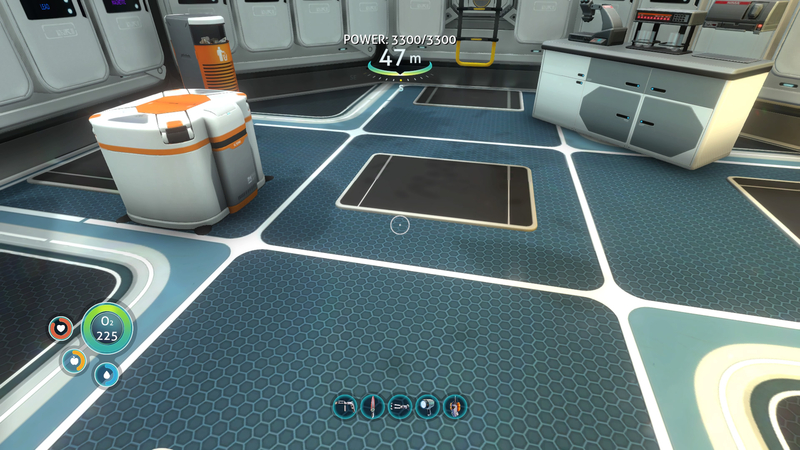 Base and Lifepod can be seen across entire gaming area. Seems like a waste of resources, the RAM should be focused on local video instead of rendering something you should not possibly even be able to see. Could be what is affecting framerate drops as the size of your base gets larger. 6. Schools of fish swim right through base. 7. Door to Prawn room (Aurora) would not open from upper access. Not sure if this was an intentional change or glitch because you can still access the Prawn room from a lower access point, but when i played the PC version this door worked when panel was repaired. This is NOT due to over use as a resource. Even if you immediately use salt and coral for water, and they are still abundant, they still vanish. As a result you cannot build Air Bladder. This usually happens within probably 30 to 40 mins. After being gone for a couple weeks (probably 2 to 3 days of game time). Reappears then vanishes again... This seems unavoidable on the PS 4. 10. Fauna suddenly for no reason bolt off like an arrow at unrealistic speeds. Non provoked. I have seen this with Bonesharks, Jellyrays, Gasopods, Rabbitrays, and even a Reefback Leviathan. This seems to happen more and more as you progress in the game. 12. 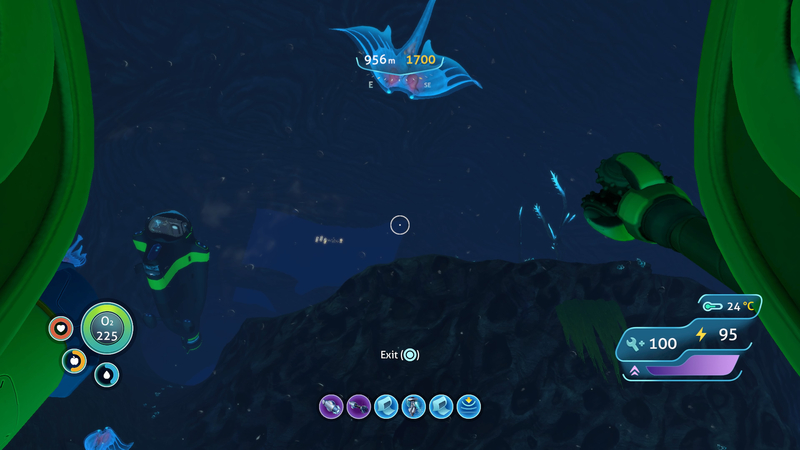 Cyclops/ Prawn/ Seamoth upgrades disappearing when saving game. 13. 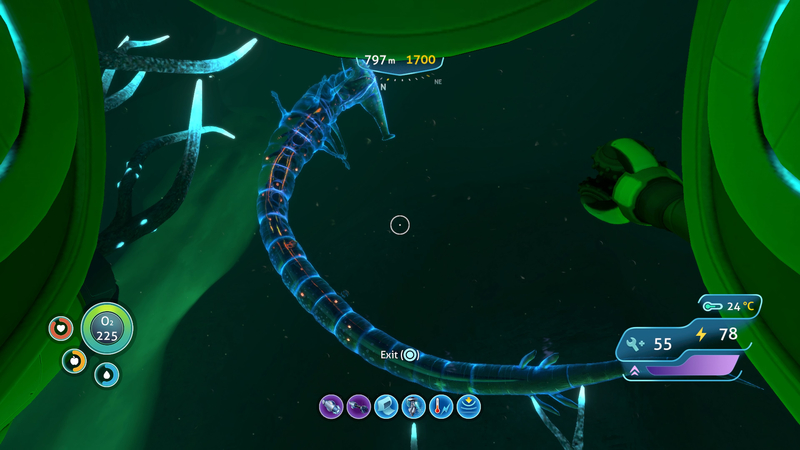 Seamoth/ Prawn/ Cyclops color changing issues. 14. Moonpool legs show up where they shouldn't be. 15. In-Game structures Resetting after rebooting Save file. Doors relocking. Have to recreate keys everytime you enter. 16. Interior Base details Flickering when you view while moving. 17. Base shadows do not render. Items attached to base cast shadows but base does not. 18. Huge areas of game not rendering. Even after waiting. 1) There seems to be a general graphics issue now where parts of the ceilings and walls of my base will "flicker." That's exactly what it sounds like. It did not happen before the 1.08 update was released. 2) Trying to build a large base in Creative mode causes the game to slow down and eventually crash, which destroys the entire purpose of Creative mode. I should be able to, as the game says, build what I want without constraint. 3) All of the major structures of the game (the Aurora, alien bases, etc.) completely reset themselves when I reload my save file. This is somewhat useful for gathering more supplies (batteries, med kits, ion cubes), but for the alien structures it means having to craft more tablets to re-unlock the gates. This is especially disconcerting when one factors in the blue tablet requiring Kyanite, the rarest and most difficult mineral to mine in the entire game, and which itself is a very limited resource (they and other minerals don't respawn unless the developers release an update). I should not have to build a new tablet every single time I reload my file if I want to go back to an alien base. To be clear: I love this game to pieces. The marine and geological lore make for a very entertaining story, and the aforementioned bugs aren't going to prevent me from enjoying the game wholesale. I just sincerely hope that the devs are listening when we report little things like these as well as the big problems. And I posted a picture of one of the Alien doors that always relocks on me too. The first base I went to with the Quarantine BFG was always unlocked, havn't been there since the update but every door I go through now is always locked when I return. I'm just glad I'm not the only one experiencing these issues. Hopefully the devs are paying attention to these forums. You aren't alone. These aren't isolated bugs just to your system, some are not even isolated to our platform. Like you and I are noticing, some of them seem to be related to the size of your base. Others bugs are just there regardless and it is only a matter of time to expose them. Another one to add to the list. 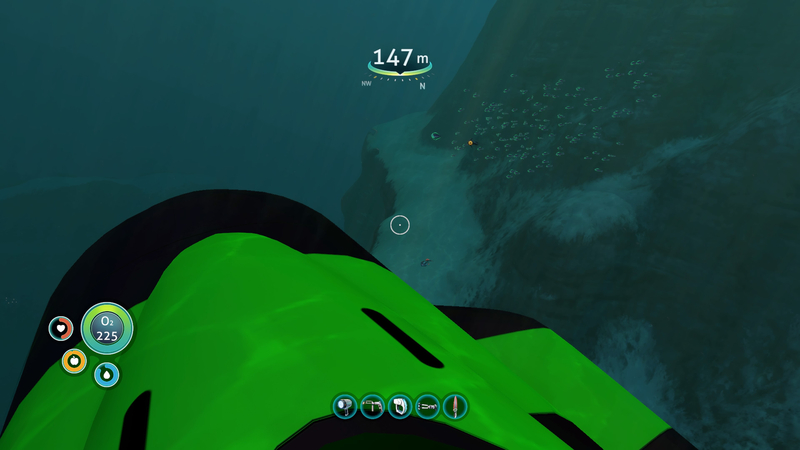 I was nearly killed last night, by falling out of my Cyclops over and over and over again. The graphics showed me falling out of the Cyclops, then landing outside on the roof ??? and loosing a huge chunk of health from fall damage. I couldn't swim. I walked off the top of the Cyclops and landed hard on the bottom of the ocean, taking even more fall damage. I still couldn't swim. Just stuck walking around the bottom of the ocean at the bottom of the Northern Kelp Zone. 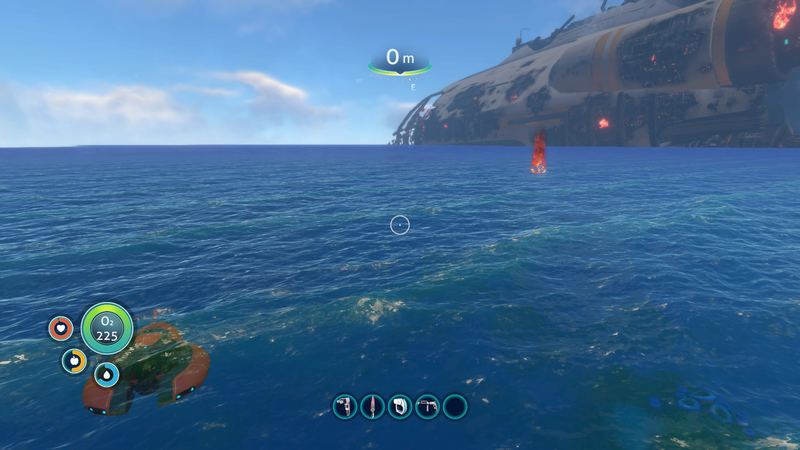 I had to walk a long distance away from the Cyclops for the game to register that I should be swimming. Then swam back to the sub. I got in, climbed the ladder to the upper deck and again fell out onto the roof outside. 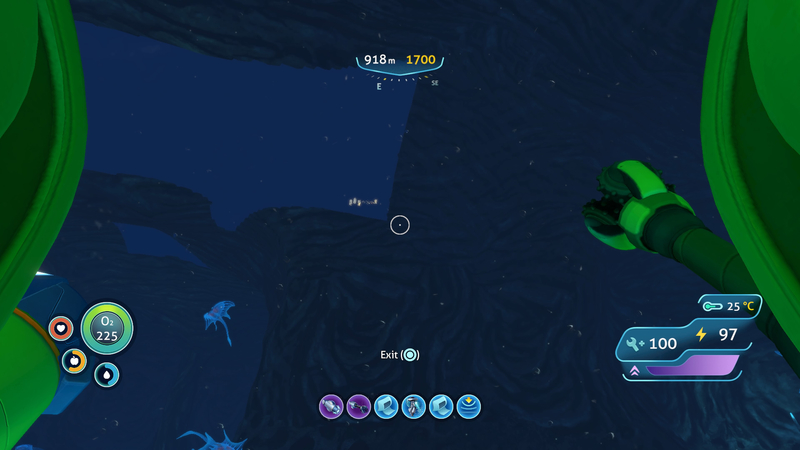 I walked off the roof of the Cyclops again, hit the bottom of the Ocean and was now down to less than 1/4 health with Crabsquid, Warpers, Ampeels, Etc... I had to walk around again for the game to let me swim. I got back to the Cyclops. Got up the ladder and ran straight to a locker to grab a couple of Med kits. While I was in menu fixing my health, I fell out for a 3rd time..... Luckily I had already gotten my health back before hitting the roof and taking more fall damage. I did the whole routine again. 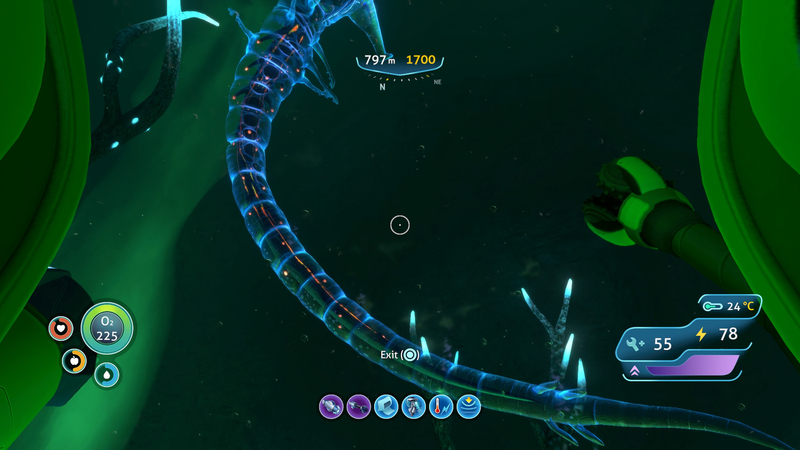 Got inside the Cyclops and quickly saved the game. Shut down the system, rebooted, and things seemed normal for the moment. This usually happens within probably 30 to 40 mins. After being gone for a couple weeks (probably 2 to 3 days of game time). Reappears then vanishes again... This seems unavoidable on the PS 4. May be linked to the fauna bolting off for no reason. 11. (Framerate drop) When traveling in Seamoth screen freezes then bursts back into motion. Swimming in Lost River and it was constantly/ continuously freezing then popping back into motion. Serious framerate drops in Lost River in 1 million year old Skull room. 12. Cyclops/ Prawn/ Seamoth upgrades disappearing when saving game. Upgrade console also being black with no color as described below. 13. Seamoth/ Prawn/ Cyclops color changing issues. Sometime just all black. 19. Falling inside and outside of Cyclops repeatedly. 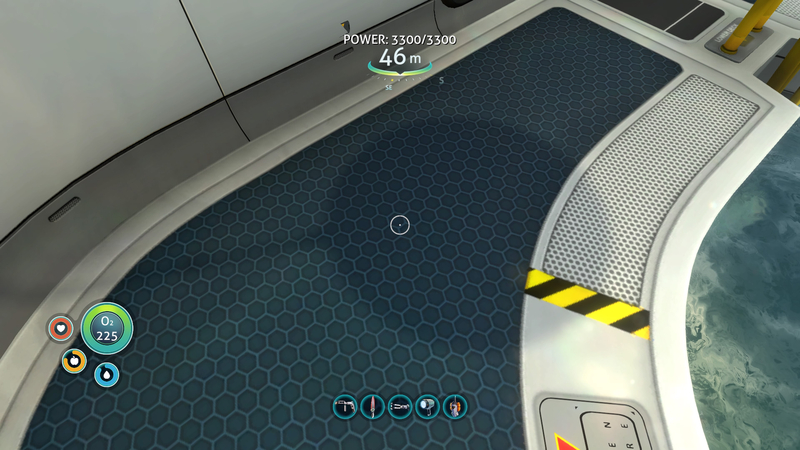 Sometime you are standing on the floor, slowly the graphic goes down then you fall through the floor and will either be falling from the ceiling and land where you were just standing before you fell, or you will start falling from outside the Cyclops and land on its roof and take fall damage, now being on the roof of the Cyclops with no ability to swim. You can walk around the outside roof of the Cyclops till you fall off and hit the bottom of the ocean, again taking fall damage in the water. Then stuck walking around the bottom of the ocean with no ability to swim. 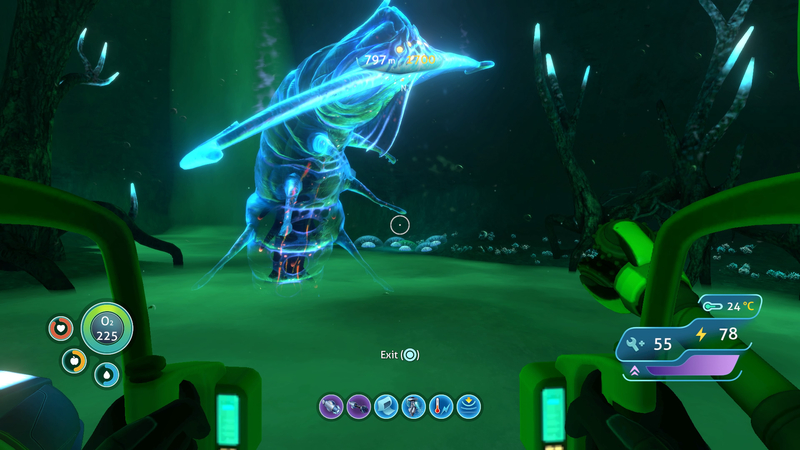 The falling out of the cyclops is a known bug which is not exclusive to ps4. There are several variants of if, the most common being the slow slide. It could be related to building inside the cyclops. It seems quite tricky to fix considering the time it has been present in the game. I dont know how to even respond to anything in this forum.... There are so many people reporting bugs that are game stopping for them. How can you say anything positive about a bug that is ignored, that has no fix posted by any Dev... Apparently for what over 3 years? Cochonou, I appreciate your optimistic view. You seem to be the only one lately who is invested in this game on a deeper level who isn't bothered much by the deeper problems of Subnautica, and willing to help put together and bring forward the missing pieces of history of some of these problems. So thank you for your effort. @HalfEvilCoyote I've been looking into your list of issues, and I appreciate you putting together the updated list. I'll try to briefly respond to the list and give you some insight on where things stand and what current efforts are ongoing. I'm currently compiling a list of the remaining issues on consoles and on PC experimental so that I can prioritize them and know when to cut the next patch(the last two were dire situations so unfortunately they didn't have as much meat as we'd like). I want to say thanks to you and others for posting here. You could choose to just leave a bad review and move on but you and others are choosing to take your time to share your issues and frustrations about the game because you want to see Subnautica reach its potential. We want to realize this too, and we recognize that there is still work to do. The thermometer was cut from the game but it sounds like we missed a few places cleaning it up so I've added that to my list to follow up on. 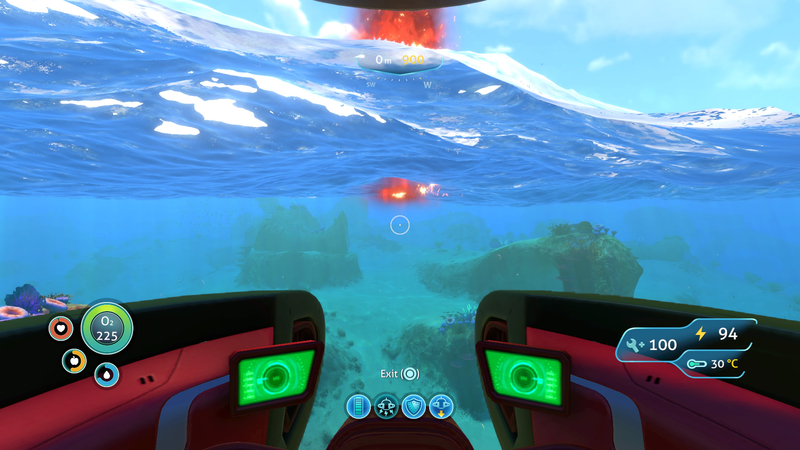 The PRAWN and Seamoth both have thermometers built into their UI, like the Thermal power plant, they can have modifications that let them recharge from heat so the idea was that since the thermometer took up valuable chip slot in your inventory but had no use for most of the game, people were not creating them and didn't have them when it mattered. The HUD for the player didn't have space for the temperature all the time so adding it to the thermal plant/vehicles was the route we took. When you reloaded did you find the same aggressive creature in the alien containment or did you end up saving and now they are there permanently? I've added this on the list to follow up with the team on what might be happening/how to safe guard against it. I was able to reproduce this on Xbox/PS4/PC experimental and not on PC release so it looks like a regression we've added somewhat recently. Will look into getting this addressed ASAP. Great observation, there are actually a few things happening here that are not visible and some that are(what you're seeing with bases seem to be rendered much further away than they need to be). That's what we were worried about as well, so we grabbed a save game from one of our most ambitious builders(happens to work on the team and was having crash issues on PS4). We were able to use this 3+ day save game to reproduce some crashes and identify our biggest memory saving opportunities. We tackled several of those over the last patch and have a few more we're testing viability and working through some complications. Our crash reports from Sony/Microsoft show crashing dramatically decreased from the patch (and most importantly users have supported those findings). So to circle back to your observation, definitely on point and those efforts are still in motion. Noted, and I've seen this as well. I have no insight yet, but it will be something I look into. Definitely not an intentional change, I tried reproducing this multiple times and did not run into the issue myself on PC/Xbox/PS4. I know you're on your second playthrough(sorry that you were blocked on your first), is it possible that that the door was unlocked by repairing and then upon a subsequent reload that the repairable panel and the door status both reverted? I'm seeing an issue with the repairable panel resetting after reloading the save in some attempts to reproduce this. When you try to repair the panel, does the door color indicator stay red or does the color go green but just not open? Thanks for noting that you've never used them for water. Can you confirm that once they've vanished they don't return? I think you might be right, my understanding from talking with the team is that this has been happening(bolting creatures) for some time even on PC side(albeit rarely). Addressing the bolting creatures would let us evaluate if the Cuddlefish vanishing was related to that. My experience and what I'm seeing from the in-game Feedback suggests the fast moving creatures is happening more frequently on consoles. To be clear, just because something has been a bug for a long time on our bug board does NOT mean we can't address it now or that it is invalid. All that means is that there wasn't time to get to the issue before the game launched. This sounds like what another board user was telling me when I reached out to them, this is not the same performance drop I'm seeing on our or the QA testers playthroughs. I see the screen shots of the area in question and will see if I can reproduce this on my end. If I have issues reproducing this, would you be interested in sharing your save game with us? If so I can reach out with details on how that would work. No worries if you don't feel comfortable doing that. I can ask for more information to reproduce it on our side. This as well as the door re-locking/precursor force fields closing are high up on my list of critical issues to address. This appears to be console specific, PS4 and Xbox. You mentioned that "when returning" to a particular precursor door(I believe the quarantine platform) that it would re-lock itself. Is this after loading the game, or just from swimming away and returning? Thank you for the detail about entering the vehicles fixing the weird dark coloring. I see from the screenshots that all four legs seem to be deployed, can you confirm if this is after returning to the area/loading the game and not right after construction? 15. In-Game structures Resetting after rebooting Save file. Doors re-locking. Have to recreate keys every time you enter. This is high up on my list to reproduce. Is this something you're noticing every time you load the game or even happening when you leave and then return without quitting the game? How often would you say you encounter this for any given door? Once you have noticed the issue, does it seem 100% reproducible? Can you just briefly go over what that repro looks like once the door is in that 100% repro state? When something like the Aurora resets, are you having to re-enter the door codes? Re cut the doors with the laser cutter? put out fires? re-repair the door panels? Or only some instances of those states? Thanks for the heads up, I have a note from your other message that this definitely wasn't an issue before 1.08, this will help us narrow down what may have affected it. Those pictures are helpful, I'm seeing the same thing on our PS4. Is this specifically the Multipurpose room? When you reload the game does the area with the hole ever seem to be in the same place? This is something we've been trying to reproduce or narrow down for a while without luck, it seems to be uncommon with some people and rare with others. Do you have any observations or anecdotal thoughts on when you might be seeing this or what you're doing leading up to this? Thanks @Cochonou for sharing the other thread, I don't have any insight on what might be happening but the two videos should be a good starting point(it may have been looked into previously so don't quote me on that). Yeah I've had a few bugs too. 5. Weird bug where if you accidentally hit the Seamoth Upgrade Module thing when trying to get in to the Seamoth and actually get in to the Seamoth the PDA will open up to the Upgrades while you are sitting in the Seamoth and when you close it, whatever you were holding before you got in is in your hand. Luckily just exiting and re-entering the Seamoth fixes that. I also wish that we'd get some sort of mouse and keyboard support for the consoles too because WOW is it annoying trying to grab/scan things. We turn at one consistent speed meanwhile everything is whipping all over the place which is made even more difficult by the momentum based movement. Playing on the console is really making me wish my PC wasn't a potato and could actually run the game. When traveling back to the Primary Containment Facility from the Lost River Ghost Forest using the portal, I fell through the ground, and continued falling. It hasn't stopped yet. I have seen this happen to people before and it's only on this portal. I play of PS4 using the latest version as of March 13 2019. I would like this to be solved pronto. Another glitch I've encountered, and a pretty annoying hindrance: My scanner room is showing me locations for limestone that don't actually have any limestone outcrops. Like either they're supposed to be there but aren't, or I've already cracked them open, but the scanner room still registers them as being there. The scanner room is supposed to make farming easier, not harder. Please fix. I've had my resource list change itself whenever I reset it. Like I reset my game because I smacked a Marblemelon and was screwed out of seeds because of a full inventory and my Scanner, which had 2 pages of scannables at the time, changed to 1. Of course then I had another problem with the Scanner camera drones being swiped by a Stalker so I reset my game again but when I looked at my scannable list I had 2 pages of scannables again. It would be nice if we could pause the scan to keep everything on the map still there but the Scanner Room stops draining power. The color Yellow doesn't seem to exist for the Vehicle Upgrade Station. From what I remember it should be able to be a bright yellow but the yellow currently available on my Seamoth is a weird puke green color...even though on the station it says it's bright yellow. Actually playing with it right now none of the vibrant colors work with the 'Stripe' option. They're fine with all the others (Base, Name, Interior) but the 'Stripe' automatically gets a darker tint to it. Why? Also it tells me to use L2 to use it but it won't let me use L2 or Square (my alternate) and I have to use R2. And if I use R2 while hovering over the color palette whatever is selected on my current color modification will automatically be changed depending on where my reticle was when I hit R2. So my Stripe could be its puke green but when I hit R2 while the reticle is over the red part of the palette the stripe will automatically turn red. I have also experienced color issue, but it's been a thing (from what I have seen) since the pre-release, so I wasn't sure if it was actually a glitch or an intentional re-shading of certain colors so that some parts of the vehicles didn't stand out too much. Haven't had the R2/L2 glitch, but then I haven't messed with the vehicle color/name modification in a while, so maybe I have yet to encounter it. @BinaryAbyss Lucky I'm getting ridiculous glitches left and right. Apparently if you take the Camera anywhere near the Kelp Forests the stupid Stalkers will home in on it and follow it all the way back to your Scanner Room and steal it. This has happened twice for me and both times I rammed the Stalker to get it to drop my Camera. It did, but then decided to make a new nest just next to my base. I reset my game but apparently I saved it just after the Stalker swiped my Camera so I just sort of let him have it and followed him back to the Kelp Forest where he and another Stalker played "pass the camera" before dropping it and swimming on their merry way. I nabbed it back and hopefully they won't come for it again...but if they do then idk what the h*** to do. At least they aren't nesting outside of my base which is far enough from the Kelp Forest they shouldn't have even ventured to my base in the first place. Edit: So apparently if you hurt the Stalkers in any way in my game you wind up breaking their AI and they move away from the Kelp Forest...you can also apparently lure them back but it takes a bit of patience. Thank you for the time in responding to our Bugs. I think many people will be happy to know that someone on the Dev side is at least aware of the problems (in whole) and also letting us know where you are with those bugs at least gives us something to look forward to. For those of us who are still waiting for a completed and playable game it is refreshing to at least know where things might be headed. I would be happy to put together a save package for you. Let me know how you would like me to do this. If you like I can capture multiple saves at the exact locations so you can just open each save and see the bug immediately instead of searching for each one all in one save. I will put together a detailed response tonight for all your questions and post them here. Sorry it took a little longer to get the full reply for you. I went back to areas and places to check on some things to better answer the questions. I think a few of these were actually caused by updates so it might make them easier to track the cause based on what I found. I will be more specific on the individual replies. Understand the decision to remove it. Can take it off the Bug list when it gets removed from the Blueprint Menu. Easy enough. I think players will no longer be mislead to believe they can build it if its completely gone. Sounds like you got it covered. The hunting behavior seems to draw the creature to to the alien containment when it is full of other fauna. Once it gets inside you can't get rid of it by saving and reloading, it will still be in there. I have read on other forums of people try to disassemble a section and timing it when the aggressive fauna is in it, thereby releasing it. Then they rebuild the missing part after chasing it off. Personally, I just killed the creature, then saved and rebooted to get rid of the body. Waiting for it to get in the right place to disassemble around it just gave it more time to kill your captive bred fauna. Biters are the most common pest. Not sure if this is related to environmental rendering problems or not. EXAMPLE: If the aggressive fauna passes the wall or glass barrier before it renders when player is coming back to base from a distance. All my gameplay experiences are in Survival and i have it too. Sounds like you have this one covered. I will be sending a 13 day save in Survival Mode with a 2 bases with the link you provided. The more I play the more convinced I am that this is the issue. In the beginning of the game it was running beautiful. I never hit a single stitch till i started base building. To be honest, personally you see it at first, but eventually your brain tunes it out, Its benign compared to many other issues in the game so I'm sure most people would not argue if it was at the end of the priority list. I just wanted to include it as others have posted about it. Standing at the door the repair panel on the left is damaged. When you look at or point the repair tool it does nothing. It is just an inert, un-registering panel, you can't interact with it at all. I have never been able to on either play through so it had never been unlocked on my system at all. So no it cant be a resetting issue. I ended up getting in from the lower access, I assumed it was just shut on purpose in the final release since there was another way in. But my youngest son was playing on PC and he went right through. Again I had read on other forums of others having the same issue. Yeah this was something I spent a lot of time trying to figure out. Once they disappear that's it, they are gone for good. I kept hoping one update they will refresh but No Dice. I have tried resetting the ram, spent hours exploring after they vanish, started a new game and did not use them for water, and they still vanished... It looks like they sleep at night though, they just sit there, perfectly still, while other fauna come up and bite them all night long. (easy prey). If you take the titanium scrap from the Stalkers they move into the shallows near the scrap spawn points and they eat the Bladderfish too. By the 3 or 4th day of gameplay they are gone, dont return, in any biome. I do think if you solve the bolting fauna you will solve the missing Cuddlefish. I thinks it'll be a 2 for 1. I have seen the Cuddlefish sit still and swirl sometimes just like when you release fish in Alien containment usually they swim away but sometimes they just sink and swirl at the bottom. Also I did a huge experiment with Jellyrays since I could hatch them, they were highly visible, small home range, and easy to find again after they bolt. Had 6 at my base to start, the number would fluctuate as I saw them bolt off once in a while and other times I didn't witness it. It seems they would bolt to the edge of the rendering perimeter and stop. If I saved then reloaded their bolting was over but they would be frozen in place till I came within the rendering distance of them then they would swim straight back to my base (regular speed) as long as I stayed within the rendering range for their intended movement to render. Once back at my base they would go about swimming in circles again. As far as a trigger, it almost seems like sometimes they bump a rock, or each other or some edge of a landscape and they take that bump as a threat and it triggers the bolting. 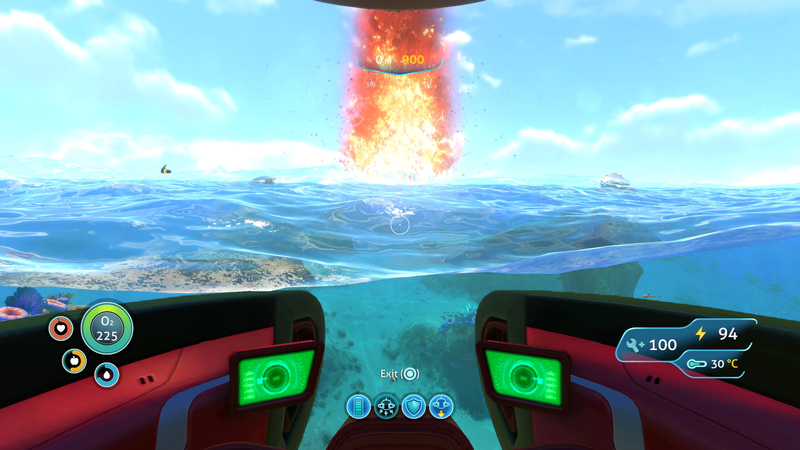 But its crazy fast and if you follow any creature doing it you can barely keep up following them in a Seamoth, and if you do follow them they never stop since they are always in rendering range of you. I am personally on a PS4 Pro. Survival mode. Boost mode OFF. 1080p Res. As long as we are using identical systems you should be able to see it immediately from my save file. Not sure why this particular room just overloads every time. Again with this one, I just listed the upgrades missing for other Player/ Members who are experiencing this. I have fortunately not had this happen to me. And I leave my upgrades plugged in when saving. Not sure if some of these problems criss-cross between the regular PS4 and the PS4 Pro. If I save and reload they go back to where they should be. Its usually if I go somewhere far (Lost River, Inactive Lava Zone) and return that the legs are deployed. Saving/ Reloading fixes it every time. I think this is related to bug 18 on the list. They both trigger in the same way. I will explain on the Bug 18 description. Ok this is one of the bugs I mentioned that I believe one of the last 2 updates caused. When I first started this game I had returned to the containment platform and it was always unlocked. I was assuming it was still unlocked but when you asked about the Aurora I did a round about in the Seamoth and everything is now close and All items/ resources have been replenished. The containment platform locked, Broken Purple tablet is back on the beach again. Aurora same thing, all doors locked, need to do codes again for access, fire extinguishers all back and full, all fires blazing, all accesses that I unblocked are reblocked, etc... And Yes, little secret everything in the game seem to respawning now since the doors started closing. Cuddlefish eggs, Ion cubes, all respawn if you save/quit/reboot. So if I used to go to the Aurora and the Containment Platform without needing to reopen doors then I think an update is causing them all to close and refresh all items inside. I am going to narrow it down to the last 2 updates because they came in succession one right after the other because of the subtitle update, and right before them I had been to the containment platform and it was still unlocked since beginning of game till now. And to answer your other question they don't seem to reset till you save/ quit/ reboot. Definitely another one caused by an update. It never did that till recently. This one is also caused by a recent update. All shadaws in the game have been affected, the base just makes it obvious because it doesn't cast any shadows of its own just things attached to it do. Solar panels, antennae, etc... Not just multipurpose room, Moonpool does it too. But like I said, appears the whole game is affected because even character shadows are very pronounced by light that isn't even there. You can be down in the dark in Lost River but the outside sunlight seems to be casting dark pronounced shadows through the roof of the cave system, causing shadows from a light that don't exist where you are. But this all looked different after one of the last 2 updates. Ok, this one seems to be complicated by the rendering distance, and again a consequence of your base getting larger. If you start the game at your base, you could busy yourself all day in the immediate area and no issues. Same with the legs showing up on moonpool. They will be where they are suppose to be. As your base gets larger when you travel a distance, the area of rendering spreads and if your base is large (also getting rendered no matter how far away you go) that's when the RAM seems to trigger into a tangle. It is trying to render a huge base at a mile or more away at all times. And at the same time render where you are. The farther you go and the bigger your base is the more it piles up on the RAM and things just start going down hill. By the time you reach the End Game Areas your base is bogging everything down. This is when your return home gets real fun because once it triggers the whole world starts falling apart. 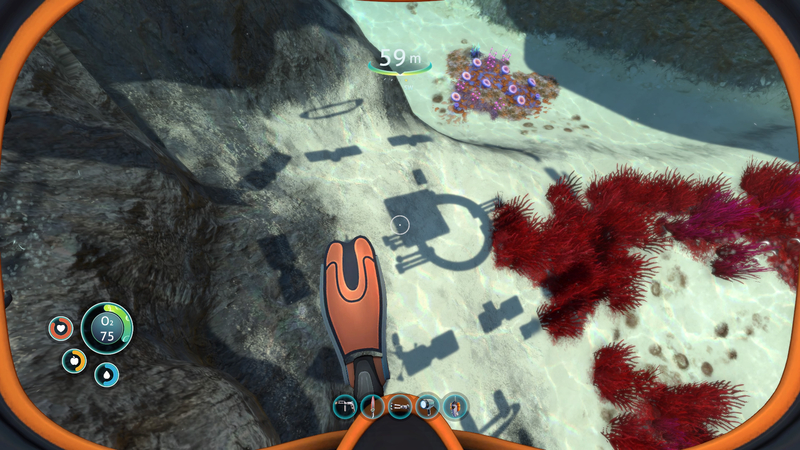 If you go all the way back to your base that's when the big holes start showing up or when you get back and the legs are deployed on the moonpool. Also a supporting factor of the idea is that before I built a base, I used to go all over with no rendering issues. All I can say about this one is once it starts I have never been able to get it to stop. Only by quitting and rebooting. Then it's ok again may not come back for a while if you reboot. 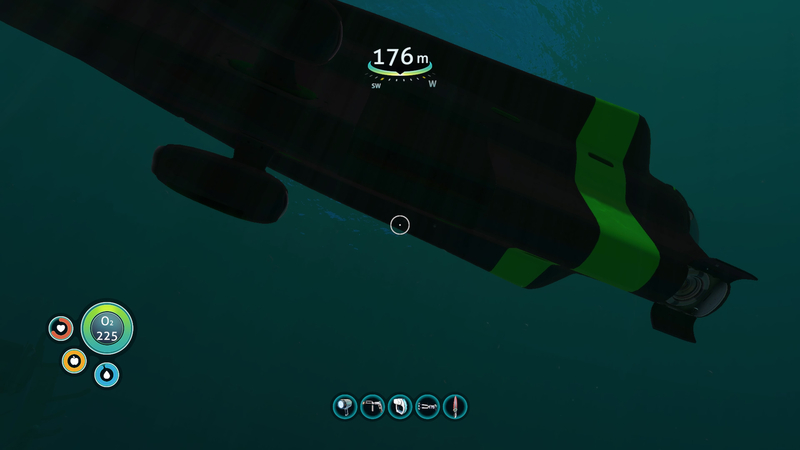 So far its happened to me 3 times where 2 of the times i was falling inside the Cyclops, only one occasion when I was falling outside, but it was every time I got back in i would fall out again over and over and over till I saved and rebooted. I will send you a save with character in the base with the Seamoth ready to go with depth upgrades. Then you can see all the crazy shadows. Jump in the Seamoth and go straight to the Lost River from the Deep Degasi Base entrance and straight to the room with the 1 million yr old skull and the Precursor Cash door and you can see how bad the lag is. Will also have Purple and Orange Keys in your inventory to play with the doors closing every time you quit and reboot. I will get the save sent to the link you provided tomorrow on my lunch break. A snapshot of my safe shallows base as seen from the ILZ entrance. Over 900 meters down underground, and over 1400 meters away. This may be part of Bug 15. Seems like before the update, before the doors started locking and everything resetting when you quit and reloaded the game. I killed this guy once and he stayed dead. Now since that update he is back and I had to killed him again. I saved and then returned and he is risen. Lazarus Leviathan. Killed him 3 times and he always returns now when i reboot. Should I get out of the prawn and go poke him? @HalfEvilCoyote You too? I thought the pillar of flame coming from the water was just me. It happened when I first finished the Aurora but disappeared after I reset. I've been encountering more landscape disappearing and I'm paranoid about setting my Prawn anywhere except on a titanium platform I built. Have you been able to track any playing triggers that instigate the landscape disappearing? I didn't have it happen to me at all till later in the game after I started base building. When it starts if I Save/turn off system/reboot save point, things smooth out again for a little while. @HalfEvilCoyote I'm not really sure. I know it was fine before I visited the Floating Islands and had the Seamoth. My first encounter was near that Bulb Zone Wreck when I was looking for the Modification Station and after that the landscape had been iffy. Though I said before that Youtubers had issues like this on the PC too. I even think I have the same issue Markiplier had in one of his videos. He went looking for the Modification Station and found a glitches out wreck and then the landscape started disappearing. I would say it could be too much data at once but I have some chunks of land that suddenly won't come back even after I restart my game. Edit: Looking at the dates of some footage and screenshots I have I might've started seeing the glitches at The Mountains Island. I play long sessions and apparently I started seeing them on the 12th. So maybe it's just visiting the islands in general? I have floating crab things too and the G.U.N. and Alien Base lagg insanely while trying to load in small details. There's also a permanent chunk of the Mountains underwater that's gone too.